Western blot analysis of extracts from HCT 116 and HCT 116 Alix knockout (-/-) cells using Alix (E6P9B) Rabbit mAb (upper) or β-Actin (D6A8) Rabbit mAb #8457 (lower). Western blot analysis of extracts from various cell lines using Alix (E6P9B) Rabbit mAb. Immunoprecipitation of Alix from K-562 cell extracts. Lane 1 is 10% input, lane 2 is Rabbit (DA1E) mAb IgG XP® Isotype Control, and lane 3 is Alix (E6P9B) Rabbit mAb. 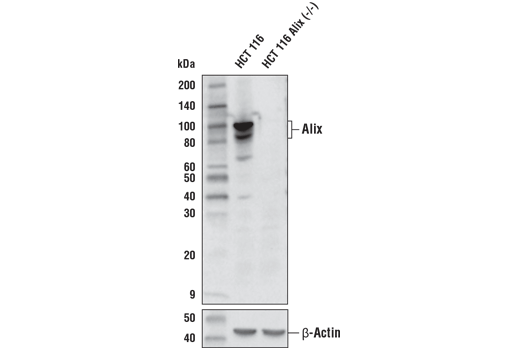 Western blot was performed using Alix (E6P9B) Rabbit mAb. 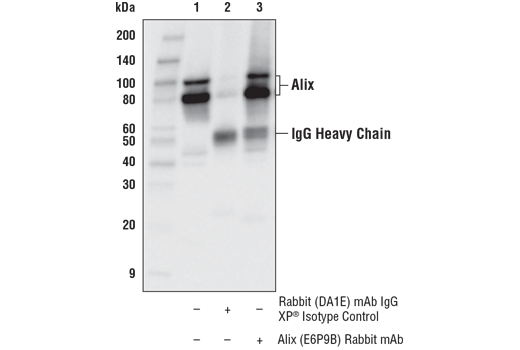 Anti-rabbit IgG, HRP-linked Antibody #7074 was using as a secondary antibody. 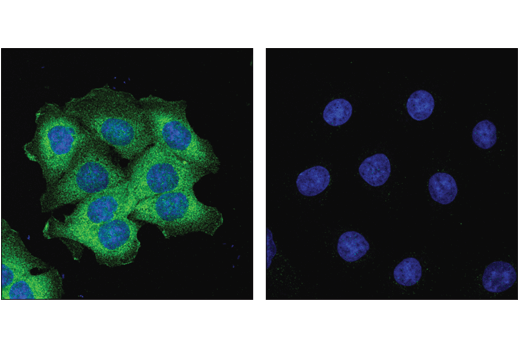 Confocal immunofluorescent analysis of HCT 116 cells (left, positive) and HCT 116 Alix knockout (-/-) cells (right, negative) using Alix (E6P9B) Rabbit mAb (green). Blue pseudocolor = DRAQ5® #4084 (fluorescent DNA dye). 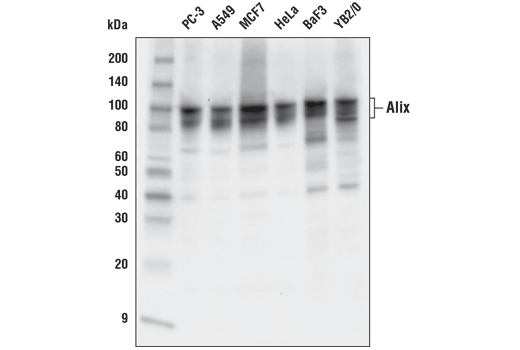 Alix (E6P9B) Rabbit mAb recognizes endogenous levels of total Alix protein. Monoclonal antibody is produced by immunizing animals with a synthetic peptide corresponding to residues surrounding Pro346 of human Alix protein. Baietti, M.F. et al. (2012) Nat Cell Biol 14, 677-85. Chatellard-Causse, C. et al. (2002) J Biol Chem 277, 29108-15. Murrow, L. et al. (2015) Nat Cell Biol 17, 300-10.